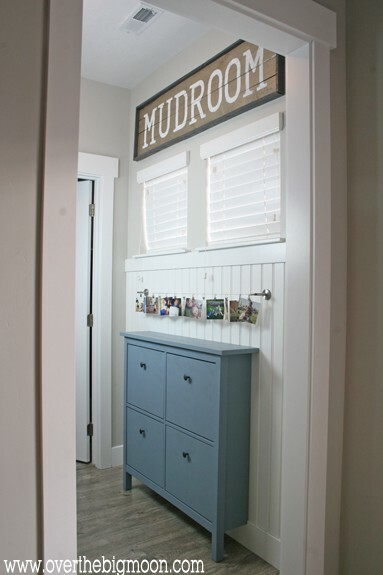 Today I’m sharing one of my favorite areas in our new house (so far) – the Mudroom! 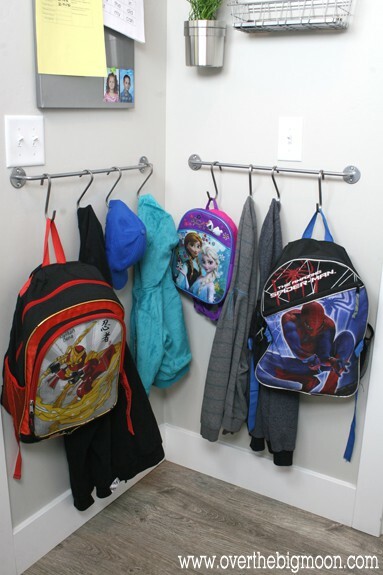 I’ve got 2 little boys and I knew that I needed a good area for their coats, backpacks, shoes, etc! We moved just 15 minutes away from an Ikea, so naturally that was the first place I headed! To start, I knew I needed a backpack and jacket area! So, I purchased 3 of the Bygel Rails and purchased S-Hooks! 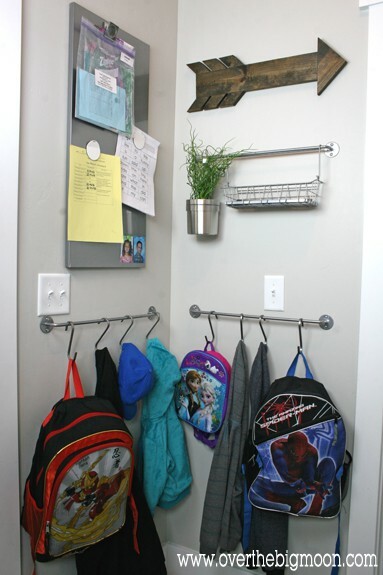 All their backpacks and jackets hang on the two bars and then on the upper bar I used it to add a little greenery in the Flatware Caddy and I use the Bygel Wire Basket to put my keys in and coupons, etc! I purchased the Spontan Magnet Board and Magnets to have a place to put the reading charts, sight words and the boys take home reading books! The cute arrow I purchased Unfinished from 302WoodWorks Etsy Store and then I stained it. Now, to the Shoe Wall! The actually room is just a small square area. So, I didn’t have an area to do a built in bench or anything like that. So, when I saw Ikea’s Hemnes Shoe Cabinet I was sold! It’s so thin and attaches easily to the wall! 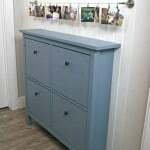 It was originally white, but I painted it with Clark & Kensington Rocky Coast. I really love the paint color! Then above the shoe cabinet I hung up Dignitet Curtain Wire and printed some of my favorite Instagram pictures and hung them up! 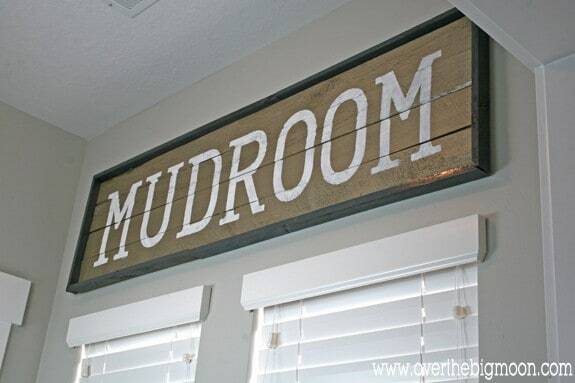 Above the windows I made this Rustic Fence Post Mudroom sign that I made! You can view the full tutorial here! 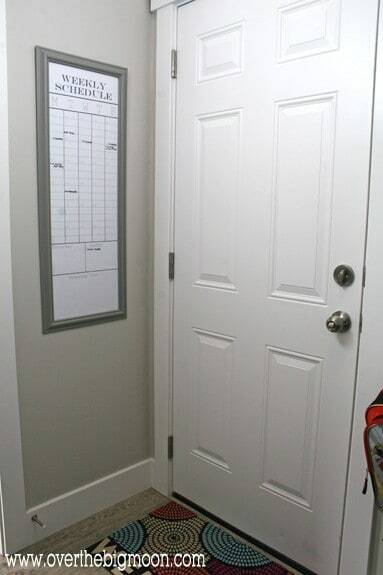 To finish off the Mudroom, I hung my trusty 12×36 Weekly Calendar! I’ve had this calendar for a while and love it! It helps to make sure that my husband and kids know what’s going on each day! You can download a copy of the Free Printable HERE! 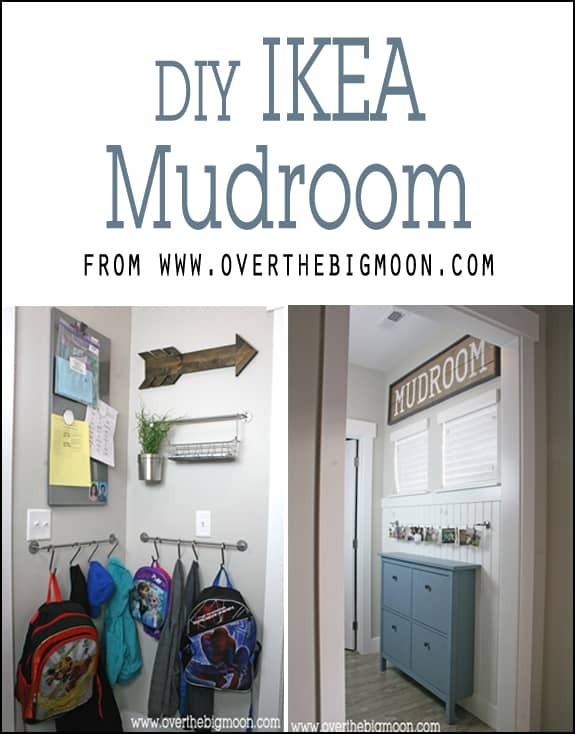 Thanks for taking the time to check out my fun DIY IKEA Mudroom! Love you all! xoxo! Thanks so much for the nice comment!! I didn’t do any before prep. I just rolled the Latex paint right on it and then sealed it using a spray Polyurethane!! It has been dinged a few times from kiddos, but touches up super easy! 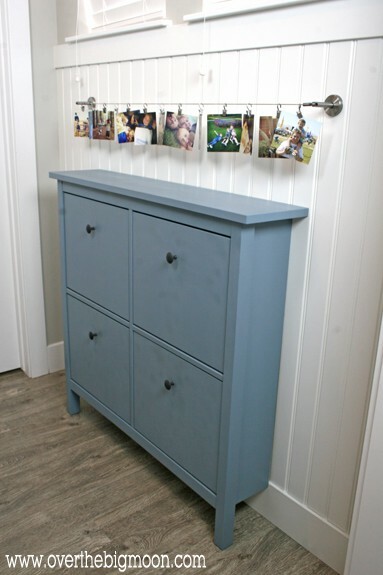 Did you do anything to prep the shoe cabinets prior to painting them? Thanks! I have been wanting to get these for our front entry. This is the cutest, Pam! LOVE it! This is perfect and I think we are going to borrow your ideas. We have a tiny space for a mud room. Thank you this is the first mud room I think we can fully borrow. I absolutely love the shoe cabinet! We have such a small space and this looks perfect for us! This is amazing! I’m looking to do something like this soon at our new home (it is becoming an absolute necessity with little kids)—I can only hope it looks half as good as yours! It for sure is a necessity Jane! Otherwise I’d have shoes and backpacks all over the ground! Your mudroom looks amazing! 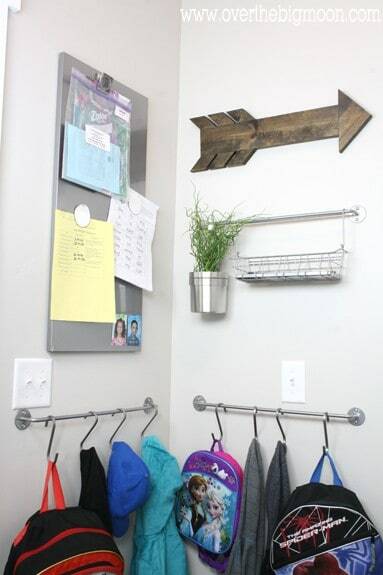 Love the sign especially and the hooks for the backpacks! Totally functional! Would be so happy if you shared it at our link party on my blog please 🙂 Look forward to looking around your blog! I love that shoe cabinet! It’s on my wish list. Okay this turned out so freaking amazing!! I am jealous! Can’t wait to make over my little laundry/mushroom now! Can’t wait to see your makeover too lady!! I love the paint too Sydney! It totally makes the room! !